"Wherever the river goes, every living creature that swarms will live, and there will be very many fish, once these waters reach there. It will become fresh; and everything will live where the river goes. On the banks, on both sides of the river, there will grow all kinds of trees for food. Their leaves will not wither nor their fruit fail, but they will bear fresh fruit every month, because the water for them flows from the sanctuary. Their fruit will be for food, and their leaves for healing.’"
Where I live in Honduras we do not always have running water, and when we do it is often visibly dirty. Never before had I realized just how precious water is. Just one day without water causes such a disruption in daily living. I can’t flush the toilet or wash dishes, let alone shower. Thankfully, I keep bottled water in the house for cooking and drinking, but even still going just a short time without water is difficult. I think often in the U.S. we forget just how important water is because we have it all the time, even in my home state of California, where they are in the midst of a drought. They may ration water for washing cars or watering the lawn, but there is always water coming out of the faucet. Still, we can see the effects that a lack of water has on the world. The plants wither and die; the lakes and rivers begin to dry up. The obvious effect of life without water is no life at all. “Living water” is mentioned many times throughout the Bible, several times in the words of Jesus himself. The people of the Old and New Testament times knew the value of water. They walked to wells to fill their buckets, as people all over the world still do every day. Even Jesus drank water from wells. They could relate to the analogy of water that brings unending life in a way that many of us no longer can. But we have all been thirsty before. We all know what it is like to desire water, or maybe a cold soda, more than anything else. Jesus tells us that he can give us water that will satisfy us forever – water that will give us new and unending life. In today’s passage from Ezekiel, we learn about this same water. “Wherever the river goes, every living creature that swarms will live…their leaves will not wither nor their fruit fail, but they will bear fresh fruit every month, because the water for them flows from the sanctuary” (Ezekiel 47:9, 12). Just imagine this place where water always flows freely and brings life everywhere it goes. But we’re not talking about literal water here. The analogy of water is one that has always amazed me. It’s why I love baptism so much. Water can give life and take it away. 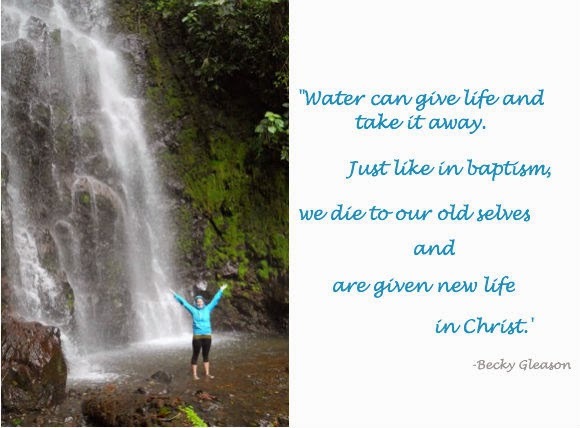 Just like in baptism, we die to our old selves and are given new life in Christ. This passage talks about the new life. If you put God in the place of the river, the verse begins with, “Wherever God goes, every living creature that swarms will live.” God brings life, plain and simple. As we push through the long somber days of Lent, we must remember that it is only by opening ourselves up to God and allowing His healing Spirit to flow through us like water, that we will reach a place of new and unending life. Becky Gleason is 25 years old and from the Diocese of San Diego. helping high school seniors apply for college.